Superb & Huge Vintage Bohemian Art Nouveau Iridized Glass Vase King Tut Pattern. 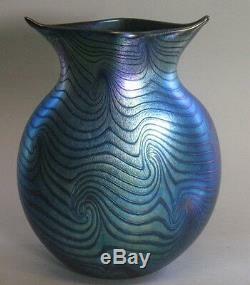 Superb & Huge Bohemian Art Nouveau Iridized Glass Vase. We also feature a growing selction of high-end contemporary & early American furniture. FREE PICK-UP IN THE CHICAGOLAND AREA. Up for your consideration is a beautiful and large antique Bohemian vase, in the Art Nouveau style. The "King Tut" pattern is produced by twisting the glass from its linear form, and it takes great skilled artisan to produce this pattern. It is hand-blown, with a polishe d pontil on the base, and a pleasing organic-form which accentuates the decor. The vase measures 10.75" tall, and 9" wide, so it is a very large piece relative to most highly decorated Bohemian glass. The vase is in pristine condition, free on chips, cracks, or scratches. There are a few scattered tiny bubble "pops, " but nothing distracting. This quote is for the Continental U. International Buyers § Please Note. The item "Superb & Huge VINTAGE BOHEMIAN Art Nouveau Iridized Glass Vase King Tut" is in sale since Sunday, November 25, 2018. This item is in the category "Pottery & Glass\Glass\Art Glass\Bohemian/Czech\Other Bohemian/Czech Art Glass". The seller is "thesapphiregallery" and is located in Chicago, Illinois. This item can be shipped worldwide.